Swipe left/right to see the tide chart of the next day or play an animation of moon phase and tide changes to get a quick overview. This Android Wear app can be used without connection to your phone. 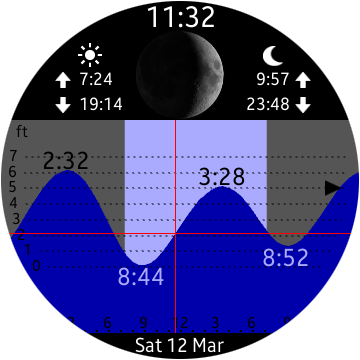 But you should run the Android phone app Tide Table Chart once per week to update the tide data on your watch.